A man dressed as a woman stands amid cycle traffic. Ok, I'll take a stab at it. In India, there are a minority group of people called hidra who are unofficially classified as a third gender. They're often marginalized in society and resort to begging on trains to scrape by. However, it's considered auspicious to have a hidra present when a baby is born at which time, money is showered on the hidra in the form of donations. Judging by his behavior, the man pictured above, I reckon, is not a hidra but simply a man dressed in women's clothing. 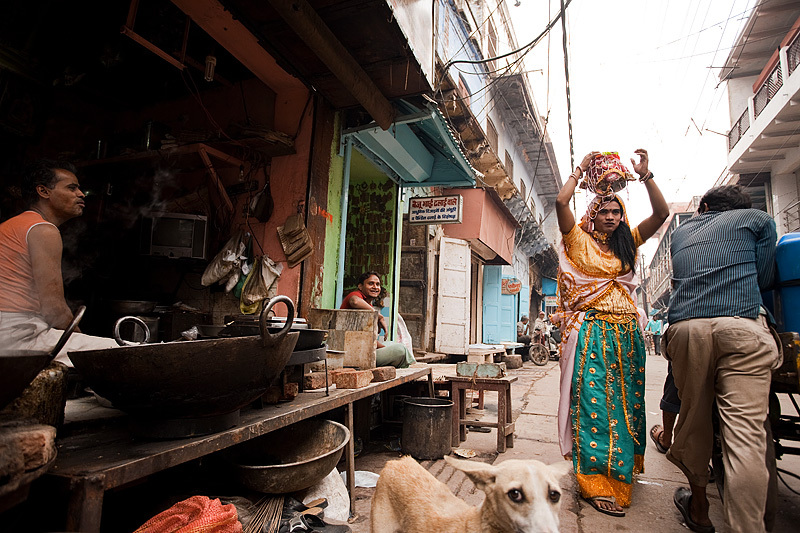 A man dressed as a woman combs the streets of Mathura delivering a message door to door. His behavior was more of clowning antics than a serious trans-gender male. At each store, he loudly announced some message in Hindi while he attempting to conceal an impish grin. Store owners openly laughed and sent him on his way without any form of baksheesh (donation). As usual, no one around spoke enough English to explain the situation but simply inferring from context makes me believe he was pulling some kind of gag. Naturally, if anyone can correct me, please, by all means, do so. I'm rather curious, myself, to know for certain. He is not hijra . Heis bahurupia and doing a drama with the shopkeepers. After finishing the drama he will requesr for money..His acting can confuse everyone. THANKS BORLAWALI! I really appreciate the correction as Indian culture is so rich and deep, I can never imagine to understand it all. Now that I think about it, he did seem a bit too clownish to be a hijra.